We have long been fans of MyColorScreen, a website dedicated to showcasing the most beautiful home screens on the planet from mobile devices. It’s this very site that has given us added inspiration throughout the years to hold our “Show off your home screens!” days. Members of the Android community continue to prove time and time again that they are some of the more creative we have ever come across. Unfortunately for those of who visit the screen sharing site quite often from mobile devices, the experience is less than stellar. It’s a visual-heavy website that doesn’t necessarily load and display content on a mobile device the way it was meant to on a big screen or computer. We have often wondered if a mobile app would ever arrive, to help fill our addiction to pretty things. Sure enough, one has. 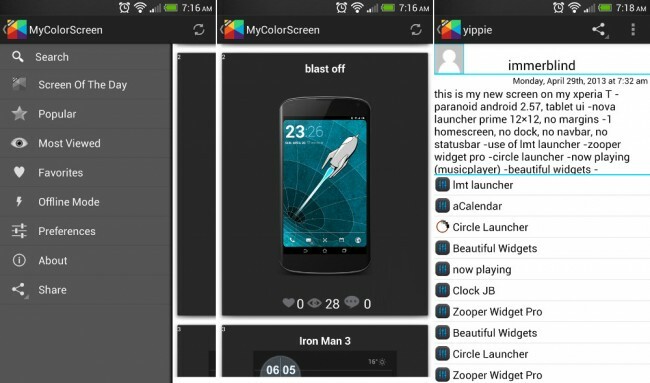 We noticed a new app generating some buzz over the weekend that was listed out as the “unofficial” MyColorScreen app in beta form. At this time, it currently lacks the ability to login or upload your own screenshots, but it does a pretty damn good job of displaying new screens and listing out apps and descriptions associated with them. You can search the entire database of screens or browse through the “Screen of the Day,” popular and “Most view” sections. The UI is clean, utilizes a slide-out navigation menu, loads new screens in real-time as you scroll, and even comes in a couple of different visual themes. There are paid and free versions of the app, with the paid version only bringing offline mode and favorites. The app is definitely in beta, so it has some work ahead. But so far, it’s had a great start and should satisfy those who consider themselves screen design addicts.